Recent headlines prove that being a woman in the film industry comes with its own set of challenges and barriers. 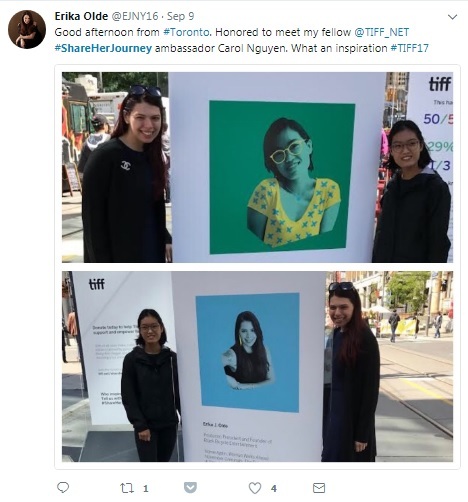 It is clear that the Share Her Journey campaign, TIFF’s commitment to achieving gender parity both behind and in front of the camera, could not have been timelier. The campaign is speaking to people. As awareness continues to grow in regard to the under-representation of female-identifying and non-binary people, members of minority groups, the LGBTQ community in film and pop culture, these conversations remain an essential part of working toward progress and resolution. We are empowering countless women tell their stories, and encouraging our audiences to share in the journeys of others who have an understanding of similar experiences. We are thrilled to say that SHJ has already surpassed its $500K target for 2017 and is on track to burst through glass ceilings everywhere. TIFF is lucky to have filmmakers Ann Marie Fleming and Erika Olde as Ambassadors for our campaign. Their creativity, passion, drive, and vital perspective into the film industry is leading the way for the next generation of female filmmakers to tell their stories and provide audiences with outstanding narratives and role models. Olde is proud to say that her purpose in this industry has been to champion female storytellers. Her production company, Black Bicycle Entertainment, has developed an identity working with very strong female filmmakers on films like Susanna White’s Woman Walks Ahead with Jessica Chastain and Home Again, the first film from Hallie Meyers-Shyer, the daughter of titan Nancy Meyers. Both Fleming and Olde strive to give women more opportunities in a typically male-dominated industry; Olde even started IRIS-IN, a programme for female filmmakers at the Ghetto Film School in Los Angeles. Fleming strongly urges audiences to support this programme: “Through the Share Her Journey campaign, we can put a global spotlight on women in film and animation. 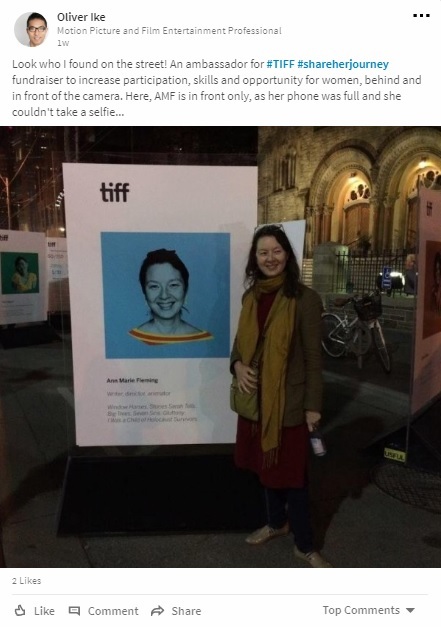 We need to take advantage of it, wave our flags, and WATCH FILMS BY WOMEN.” TIFF could not have dreamed of having two such incredible Ambassadors.